"Yara is a tool aimed at (but not limited to) helping malware researchers to identify and classify malware samples. With YARA you can create descriptions of malware families (or whatever you want to describe) based on textual or binary patterns. Each description, a.k.a rule, consists of a set of strings and a boolean expression which determine its logic"
Yara can be used to search patterns in malware, memory dumps, network flows, etc, so it is a very handy tool that every Incident Handler and Forensic Analyst must know. 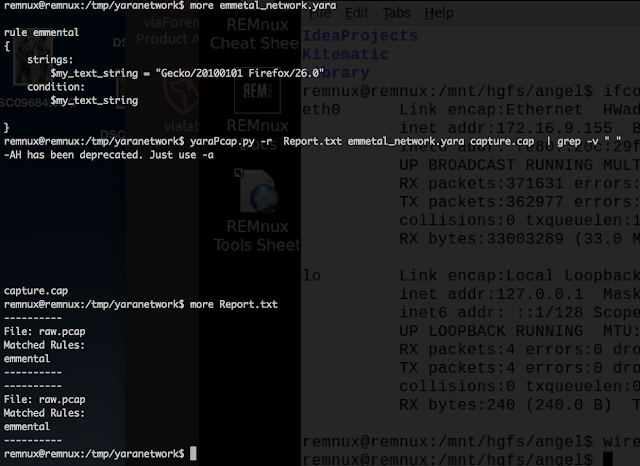 There is already a nice project, yararules, which is a repository for rules to detect malware, even for mobile malware. However, I did not find any specific rule for emmental malware, so I am going to create a very simple rule to detect it. $my_text_string2 = "SMS Intercept error: Phone not setted"
$my_text_string3 = "SMS Intercept enabled over buffer"
$my_text_string4 = "Get config data from server"